It's cheaper. Devices can connect to 4G networks with chips that are less expensive to make, because they are half-duplex and have a narrower bandwidth. Long Battery Life. Devices can enter a "deep sleep" mode called Power Savings Mode (PSM) or wake up only periodically while connected. That mode is called extended discontinuous reception (eDRX). Read more on eDRX and PSM. Service Costs Less. Because the maximum data rate of LTE-M devices is only about 100 kbits/s, they do not tax the 4G network as much. Carriers can offer service plans that closer to old 2G M2M pricing than 4G pricing. LTE Cat-M1 technology is one of the two answers that 3GPP has for the rise in IoT-only network technology. SigFox is a french startup who started the technology movement that has become known as LPWAN (Low Power, Wide Area Networks). 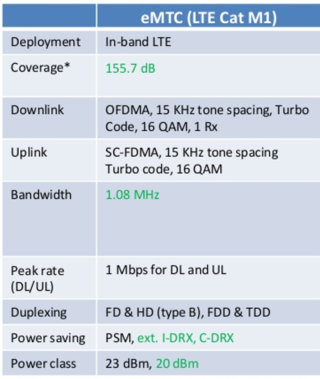 Interest in LPWAN techonology has lead to many readers asking us: What is LTE-M? Read more on the history of LPWAN. The other 3GPP technology is NB-IOT (Narrowband IOT), which uses an even simpler access scheme (Single Carrier Frequency Division Multiple Access) to further drive down cost and complexity. There are two camps of NB-IOT technology out there, and much of the US based cellular infrastructure (based on Alcatel) will not be compatible with NB-IOT. Read more on NB-IOT here. 10 year battery life on a 5WH battery. Device cost comparable to GPRS based IOT devices. Extended coverage (> 156 dB MCL). Variable Data Rates - to enhance coverage. The reality today of LTE-M is that it is still not *quite* ready for prime time, as the specifics of PSM and eDRX are still being coordinated between infrastructure providers, chipset manufacturers, and network operators. In the US, Verizon is driving an aggressive schedule to ensure a LTE-M1 network launch early in 2017. 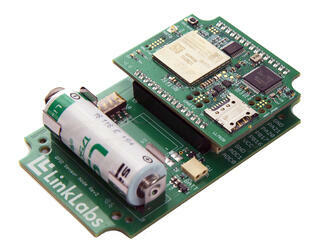 Link Labs is a Verizon partner for LTE-M, and our initial product is the Sensor Suite, which allows sensor devices to be connected directly to LTE-M.
Low Density Sensors. For businesses or OEMs that use sensors as part of their business (Cold Chain Monitoring), removing the headache of connecting via WiFi or a gateway is a huge deal. The thought that a sensor can be fielded with a long-life battery, and that it would "just work" is a huge deal. Automated Meter Reading. Because of the cost of previous technologies, cellular based AMR has been less popular. Now that cheaper chips can connect for less, we will see more and more meters connecting via LTE-M.
Asset Tracking with LTE-M. Hybrid asset tracking solutions that use short range connection like Bluetooth, coupled with backhaul via LTE-M are poised to do very well. One application technology we like in the RTLS space is AirFinder. PPP connections are not the norm. Battery powered LTE-M devices need to use simple UDP/TCP commands to send and receive data. A small, power efficient sensor device cannot host PPP. Serious embedded development is required. Making this easier is part of our focus at Link Labs. Security and Power are oil and water. A big fat Linux OS has no issue handling complex security requirements for services like MQTT on AWS IOT. A little power constrained MCU on the other hand, will struggle. Be sure to plan for the complexities that security will require when you have a tiny processor and tiny battery. Holy Pulse Current, Batman. 23 dBm maximum transmit power is no joke. Your LTE-M device will have to be able to source 500mA or more of peak current when required by the LTE-M module. Things like super caps can help, but planning for the correct battery chemistry and capacity is critical. If you are interested in help bringing an IOT device to market using LTE Cat-M1 technology. Please contact us.